You are currently browsing the tag archive for the ‘1929’ tag. Well, here’s a real treat: an educational/promotional film directed by Max Fleischer & F. Lyle Goldman to explain sound film, right from the era in which this new feat. was introduced. 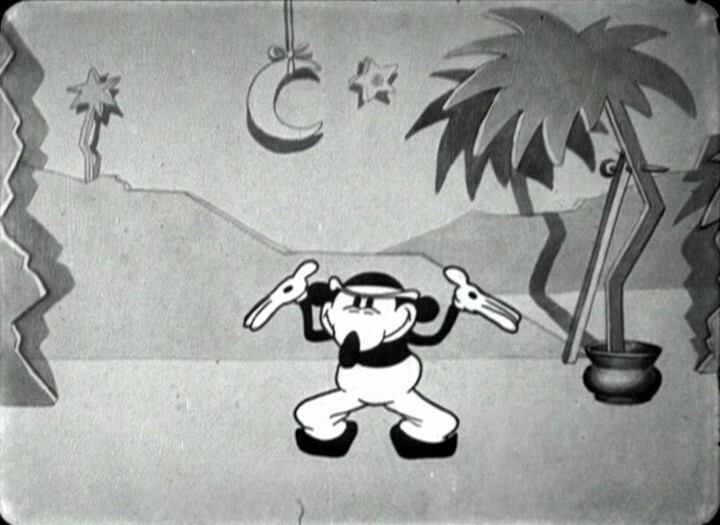 The film starts with a sound film role changing into a cartoon figure. The sound film takes a silent film to a professor, who explains how sound film works. The film is most interesting, for it clearly shows the tremendous amount of changes that had to be made to make sound film work. For example, in live action films the camera was now placed inside a box to prevent the primitive sound recording microphone from catching up the sound of the camera itself. And theaters, too, had to invest in the change. The screen had to be porous to let the sound through produced by giant loudspeakers behind the screen. The designs and animation of this little film is still firmly rooted in the 1920s, and the animation is remarkably stiff, especially when compared to contemporary Disney cartoons. And although the characters talk a lot, lip synchronization is only suggested, but not really there. 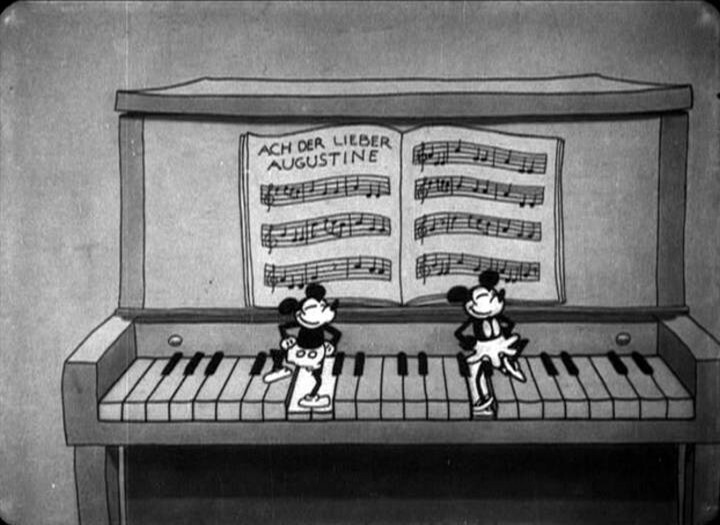 In fact, Fleischer would mostly neglect lip synchronization way until the end of the 1930s, only using it minimally. The voice over, too, is a little bit dull and hesitating in explaining the processes, but in the end this film is too unique a document of its time not to enjoy. 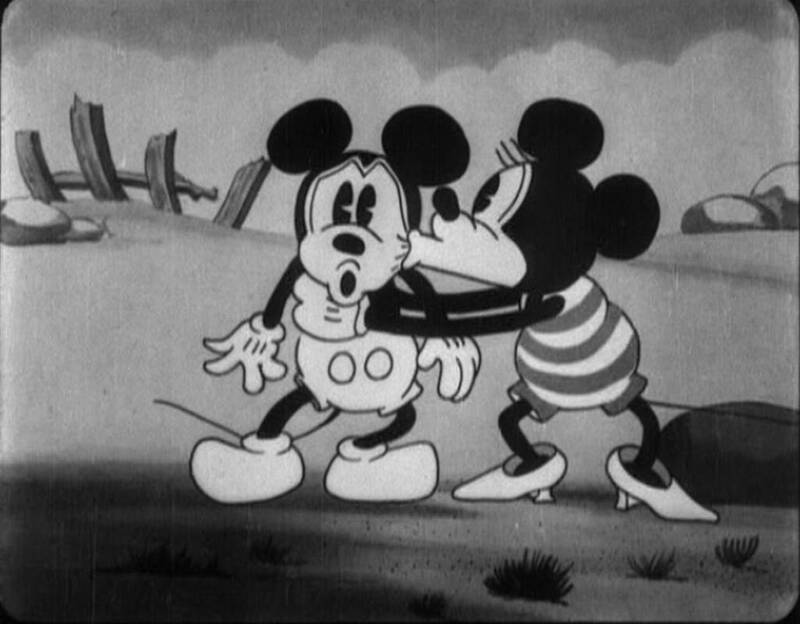 ‘The Haunted House’ is Mickey’s first horror cartoon. In this short he hides from a rain storm in a house, which appears to be haunted by skeletons. 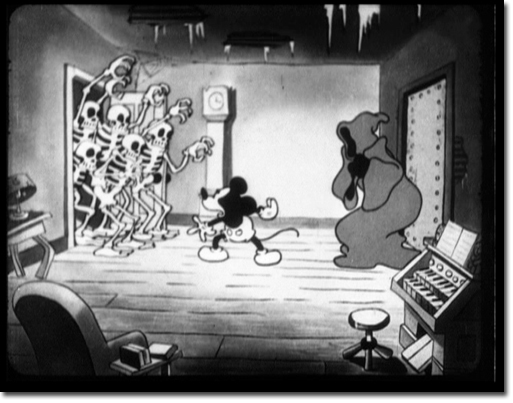 A cloaked skeleton orders Mickey to play on a harmonium, while all the skeletons dance. This sequence reuses some footage of four skeletons dancing from ‘The Skeleton Dance‘. Unfortunately, the new animation on dancing and playing skeletons is hardly as good, and the dancing sequence feels more primitive than ‘The Skeleton Dance’. However, the opening shot is beautiful, with the house flexing in the wind. There’s also some good animation on the cloaked skeleton, and a beautifully lit scene when Mickey strikes a match. 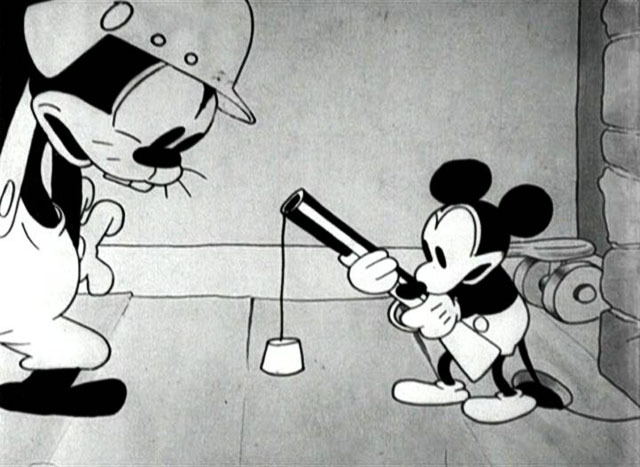 Mickey’s role in this short is very limited, and his only function seems to be being the carrier of the audience’s fear. Indeed, he looks repeatedly into the camera for sympathy, dragging us into the haunted house with him. 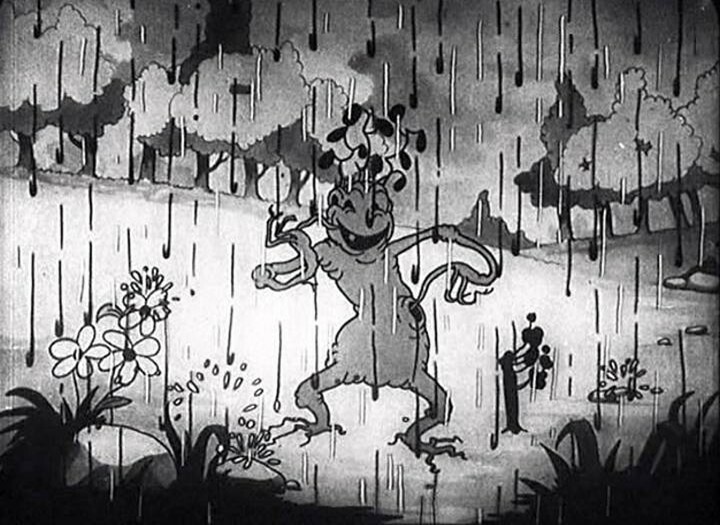 The early scenes of this cartoon manage to evoke a genuine feel of horror, but in the end this short resembles the boring song-and-dance-routines of both the early Mickey Mouse and Silly Symphony series too much to be a stand out. Mickey would return to the horror genre in ‘The Gorilla Mystery‘ (1930) and ‘The Mad Doctor‘ (1933), with much better results. 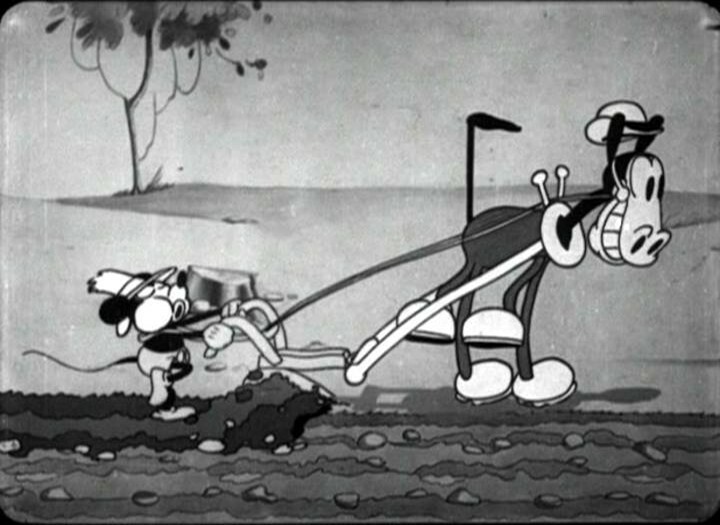 ‘Springtime’, the third entry in the Silly Symphony series, is also the first of four Silly Symphonies devoted to the seasons. 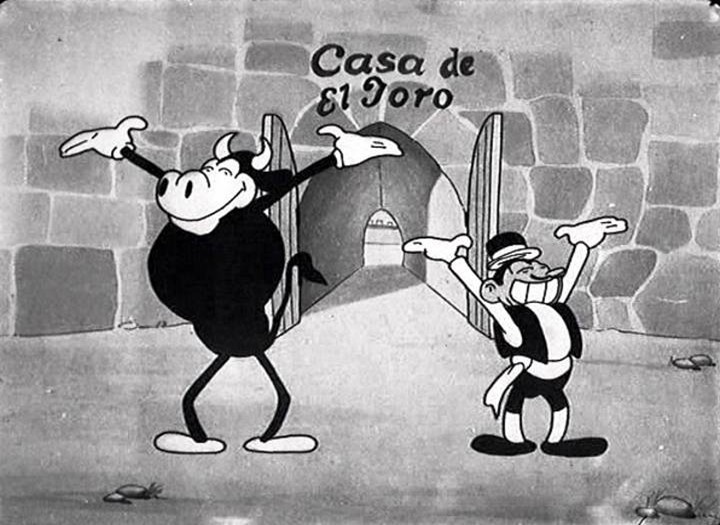 Animated by Ub Iwerks, Les Clark and Wilfred Jackson, it sets the tone for many Silly Symphonies to come: the atmosphere is fairy-tale-like, there is no story whatsoever, but only one long dance routine. One had to wait two years, until ‘The Ugly Duckling‘, to watch a Silly Symphony escaping this rather limited format. In this particular short we watch flowers dancing to Edvard Grieg’s ‘Morning’ from ‘Peer Gynt’. The flowers are very similar to the ones in ‘Flowers and Trees‘ from 1932. There are also several dancing animals: bugs, a caterpillar, crows, grasshoppers, frogs, a spider and a heron. The latter three dance to Amilcare Ponchielli’s ‘Dance of the hours’, which would be reused in the much more famous ‘Fantasia’ (1940). Besides the dancing there’s a remarkable portion of devouring: the crow eats the caterpillar, the heron eats the four frogs. The most extraordinary scene is the short rain storm scene, in which we watch a tree bathing in the rain. However, one other scene particularly deserves our attention: in it we watch a rippled reflection of a dancing frog in the water, an early and interesting attempt of realism. Many of these attempts were soon to follow, and the Silly Symphonies became Disney’s laboratories for experimentation towards better animation. In ‘A Hundred and One Dalmatians”Springtime’ is shown on television during a scene at the old De Vil mansion: we can watch the dancing flowers and frogs, and the short’s score provides the background music for a large part of the scene.